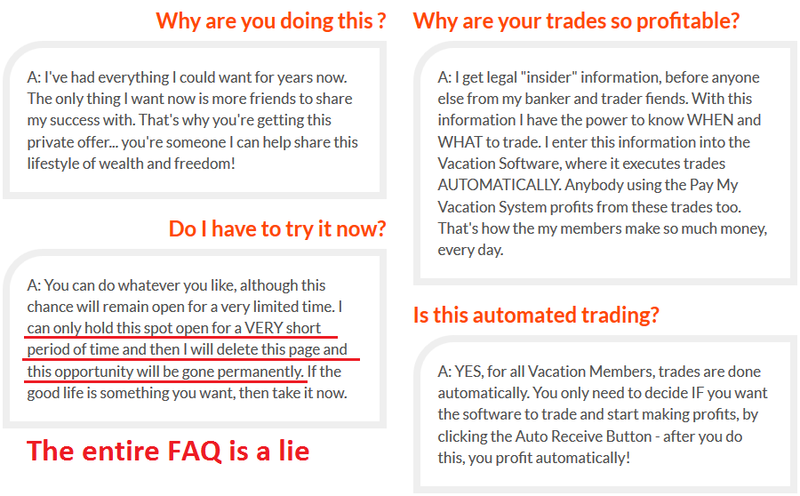 Pay My Vacation software claims to be a trading software that can make you over $17,000 every single day, but don’t be fooled. I’ve had 2 unfortunate readers who lost money over Pay My Vacation scam, so make sure you are not the next. Upon request, I researched the scam thoroughly and found several powerful evidence that should convince you to steer clear of it. If you are considering to sign up, read the full Pay My Vacation review before you make up your mind. 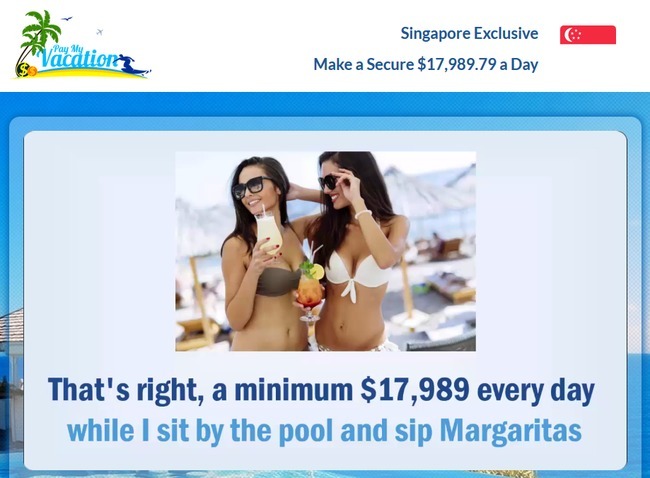 Even after reviewing more than 100 binary trading software scams, the sales video of Pay My Vacation strikes me as one of the most outrageous presentations I’ve ever seen. First off, the potential victims are shown clips of ladies enjoying on the beach, and photo-shopped bank statements with millions of dollars profits right from the start of the sales video. Of course, this is just a common scam tactic used to arouse the interest of unsuspecting internet users. People who got interested will no doubt watch the rest of the video, and that is where they are brainwashed into buying the scam. I mean, come on, who wouldn’t want to make at least $17,000 on autopilot? The question is – are automated profit softwares like Pay My Vacation even exist? The short answer is no. 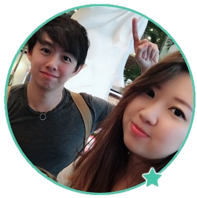 Making money online requires time and dedication, just like any other businesses. There is no free lunch in this world. Remember this well and you will save yourself from future scams. Now that you have your expectation right, let’s take a look at the first evidence to show that Pay My Vacation is a scam. 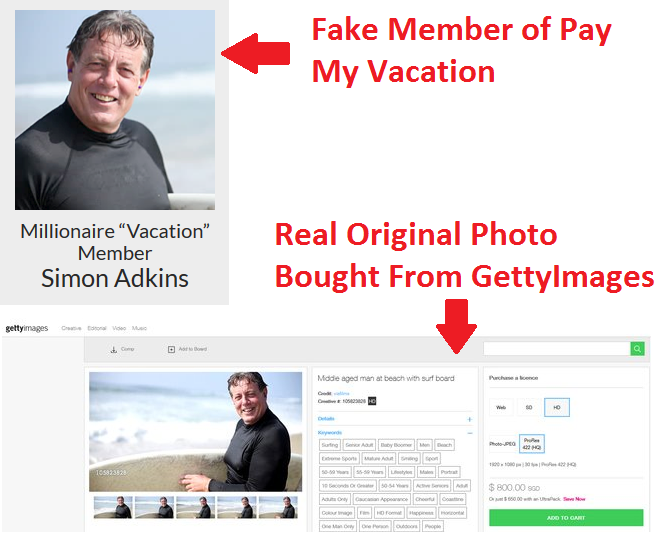 Below the sales video, we can find several member profiles who claim to be Millionaire “Vacation” Members. These profiles are complete with names and profile pictures. As usual, I did a background check for these profile pictures to authenticate their identities. Unsurprisingly, these pictures turned up to be stock photos from GettyImages website. Stock photos are basically royalty-free images that are freely sold on vendor websites such as ShutterStock and GettyImages. Anyone can buy these photos and use them for advertising purposes without copyright issues. Usually, these photos are used to portray a service rendered, for example spa-related photos are used in massage parlors while beach-related photos are used for watersport service providers. 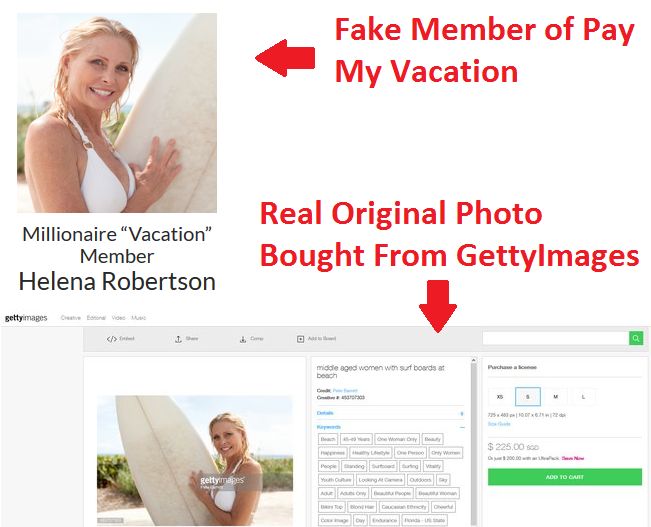 But in this case, the scammers behind Pay My Vacation purchased the stock photos and fabricated fake identities for them, as if they are real members who have benefited from the software. This is a common tactic used by online scammers to boost the confidence for their scam, and also to convince potential victims that the software works for others. My readers who fell for the scam said they were convinced by the seemingly legitimate member reviews. Don’t fall for this trap, because these members simply do not exist. How long will Pay My Vacation software remain available? In the FAQ section, the scammers did not forget to give us another nudge to sign up to Pay My Vacation software immediately. It’s said that the spot will only be held open for a VERY short period of time, after which the page will be deleted permanently. So, how short is it exactly? To answer this question objectively, I consulted the whois information for the website, paymyvacation.com. Whois information contains important details such as the creation date and expiry date of a website. As we can see from the screenshot, the website paymyvacation.com has been around since 14 Jun 2016, and this review was written on 27 Sep 2016. Which means that the scam has been up and running for at least 3 months, and it’s still not running out of spots. How long will it remain available? Your guess is as good as mine, but I’ll bet my money on “as long as there are still victims falling for the scam”. If you have provided your email address to “reserve” your spot, you will be invariably brought to the members area, where they congratulate you for “being one of the last people that made it in”. Of course, as proven in the section above, the scam has been around for at least a few months, and thousands of victims are still being scammed every single day. You are NOT the last person who made it to the page, it’s just a marketing tactic used to make you think that you can’t miss the chance. To make sure you don’t have time to analyze the scam rationally, the scammers included a fake countdown timer to force its victims into action. How do I know the timer is fake? There’s one easy way to find out. While you are on the page, remember the time remaining on the timer and hit F5 to refresh your webpage. No matter how much time was left, the timer will reset to 15 minutes. It is actually just a pre-programmed timer set to countdown every time the webpage is loaded. There’s no such thing as “holding your spot for a limited time”. If you decide to sign up for Pay My Vacation, you will be required to open a new broker account with their partner brokers, which are unregulated by monetary authorities. Once you fund your trading account with at least $250, the software will be activated to generated automated trades on your behalf. However, it is just a generic binary trading robot that generates random trades for the users. Victims typically lose all their deposits within hours of activating the software. The losses are pocketed by the broker, which is then shared with its partner-in-crime – the scammers behind Pay My Vacation. PAY MY VACATION IS A SCAM. I strongly advise you to stay away from the scam if you don’t want to lose your hard-earned money. Gemini 2 Trading Software Review – Scam in Action! Thanks for exposing the scam with strong proofs. I knew it had to be a scam but didn’t know where to find proof.